New Mexico's enchanting sunlight, sky and desert meet the mystery of the early Southwest at Salinas Pueblo Missions, now in its 100th year as a national park. The colorful ruins of 350-year-old colonial churches and prehistoric Indian towns are a ridiculously easy (and very scenic) drive away from the traffic and noise of Albuquerque and Santa Fe. And admission is free – let's go! Beneath the Manzano Mountains, the monument's three mission-and-pueblo sites form a triangle around Mountainair, population 1,054 and the park headquarters and visitor center. The 6,500-foot elevation offers a breezy summer escape, with warm days and cool nights. Awaiting you are not just piles of old rocks. 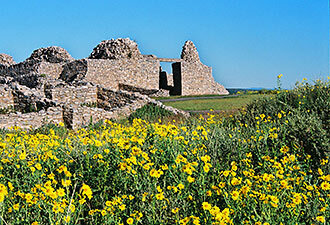 The Quarai, Abo, and Gran Quivira pueblos and missions are prehistory and history surrounded by stunning landscapes. And they are surprisingly close: Only 75 minutes from Albuquerque and about 90 minutes from Santa Fe. Do it all in a day or stay the weekend. Mountainair has lodging options and there is camping nearby in Manzano Mountains State Park and Red Canyon campground in Cibola National Forest. Picnic amid red sandstone ruins at Abo, where Spanish monks built the first mission in 1629. Join a ranger-led hike to ancient Indian petroglyphs or look for great-horned owls (and 100 other kinds of birds) in the church walls at Quarai. Bring binoculars! Peer into ceremonial kivas at Gran Quivira, a complex of blue-gray limestone atop Chupadera Mesa. “Walking around that site, you can see for miles. It's amazing,” says Norma Pineda, the monument's chief ranger. This is a fitting place for comings and goings. 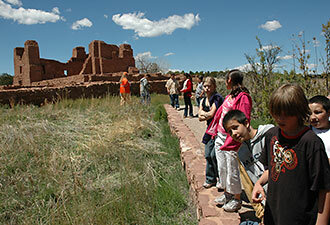 Ancestral Puebloans – formerly called “Anasazi” – settled the neighborhood back in the 10th century. Spanish conquistadors came in the late 1500s, and priests and churches followed. For barely a century, they coexisted until drought, famine, and disease took over. In a single decade, the 1670s, as many as 4,000 villagers and the Spanish missionaries abandoned the pueblos (hundreds died) and resettled along the Rio Grande. Listen carefully in today's stillness and you can almost hear the ghosts: Villagers, missionaries, and the Apache raiders who hastened the fall of a once-prosperous trading center. 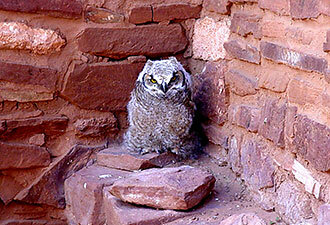 Ready to get away to 17th-century New Mexico? Before saddling up, scope out more activities at the park's website and the National Park Service's American Southwest travel itinerary page. And if you teach school, here's some cool extra credit: Salinas Pueblo Missions' lesson plan part of our online “Teaching with Historic Places” series.